The American Way, a documentary chronicling the journey of one man across the country in search of the genuine American voice, has begun shooting. Joshua Cook, who created the project, will serve as director and will be conducting the interviews. Dane Kroll will serve as cinematographer and Adam Macy will be producing the project through Temporary Productions, his production company based out of Los Angeles. In each city that they visit, the crew will interview average Americans on the state of the union, the state of political discourse and what they see and want for the future. Between destinations, the crew will both film the natural beauty of the American landscape and interview fellow travelers. The final produced film will juxtapose the words of Americans from a variety of backgrounds and iconic images of the nation with the narrative of Joshua’s quest to find the common ground and shared experience that defines America in the 21st Century. So, as it turned out, somehow, Joshua had read my website, and since he was traveling through Louisiana, he wanted to know if I’d be interested in interviewing with him. And since I’m obviously a big believer in shameless self-promotion and enjoy hearing myself talk about the “state of political discourse,” I readily agreed. I’ve never been in a movie before– though I was sitting next to someone at the Democratic National Convention during an interview that aired the next morning on MSNBC and, when I was around sixteen, I walked by Richard Belzer in Times Square when the cameras were rolling during an episode of Law and Order. And oh, once, when checking into a hotel in Los Angeles, I walked right into a Ron Jeremy movie. I promise: It’s not what it sounds like. Anyway, Joshua showed up in Alexandria only three days later, and after meeting my good friend Daniel T. Smith, he decided to interview both of us. Joshua is asking the same questions of everyone he meets. Questions like: What is the American Dream? Do you think you have a voice in corporate America? How does money influence politics? Seemingly simple questions that actually require serious contemplation. 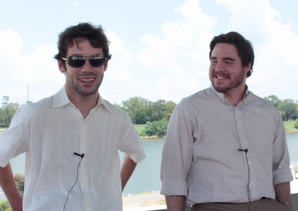 Daniel and I took them to the Alexandria Riverfront Amphitheater for a couple of reasons: First, it offers a great panoramic view of the Red River (if you’re going to interview someone in Alexandria for a documentary, there’s no better place), and second, it is almost directly behind the now-shuttered warehouses of The Town Talk. From the beginning, I told Joshua that I wasn’t really interested in talking about myself- honestly– and much more interested in telling the story of The Town Talk and the ways in which our community newspaper has been transformed and irreparably, fundamentally altered once it became the corporate asset of Gannett Company. The shuttered printing press warehouses are only a part of the story. So, apologies in advance to the good men and women who work at the local paper, but trust me, it was nothing personal. If anything, both Daniel and I, in our own ways, were attempting to defend and champion the necessity of a vibrant local news media as a critical component of our democracy. I hope that comes across. Finally, to Joshua and his crew: I did my own fact-checking. I said the paper was founded in 1896; it was actually 1883. I also implied Gannett purchased it directly from the local family that had owned it for over a century. It was actually Central Newspapers that first purchased the paper; then, Gannett bought Central Newspapers. (Just want to ensure the facts are right). It was a real honor and privilege to participate in this project, and if it does, in fact, make it into Sundance, Joshua, I only ask for one thing in return: A seat at the premiere.